I always see people discussing their aircraft insurance online. Like most folks, they are typically looking for better treatment from their agent or better prices. Everyone else is either a new or potential aircraft owner looking for suggestions as to whom they should contact for aviation insurance. Ginger and I have dealt with several agencies through the years. Some have been good and one bordered on criminal. Yet, they all operated in pretty much the same manner. Let's face it, the aviation insurance business is thirty years behind everything else the same way aviation itself is. Status quo is the modus operandi. Because of this, we've learned to accept sub-standard business practices when it comes to the subject. Always one to try something new, Ginger recently gave the new Sporty's Insurance Center a try. I remember the moment clearly. Things were quiet in the house, then I heard her walking briskly through the living room towards me. Something was up and I hoped it was good. Strutting into the room as if she'd won a gold medal, she proudly stated, "I just saved us hundreds of dollars by switching to Sporty's." Additionally, as Ginger continued her upbeat report on the experience, she told me how the Sporty's service offered a more modern method of getting a quote online. That was great news. It also made her day. 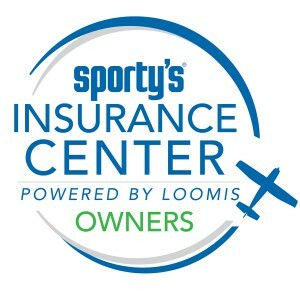 If you want to see for yourself, go to Sporty's Insurance Center and give their quick quote service a shot. You may be surprised. Ginger certainly was, and that isn't easy. Unfortunately they exclude insuring anything on floats or skis at this time. But you are correct, their site is pretty straight forward! I really agree with it. Suppose you are travelling somewhere and something happens in between very tragedic, you might face problems. So, it's better to get insurance policy. I would recommend you must get Insurance policy from National Insurance Company.